The Abbott Lowell Cummings Prize is awarded annually to the publication that has made the most significant contribution to the study of the vernacular architecture and landscapes of North America. Clifton Ellis, Chris Wilson and I were privileged to read the fine books nominated this year and I thank my colleagues for their thoughtful service. Our charge was to look for the publication that best exemplifies the spirit of the awardundefineda work based on primary research that emphasizes fieldwork, that breaks new ground in interpretation or methodology and that contributes generally to the intellectual vitality of vernacular studies in North America. A Manufactured Wilderness fuses the study of childhood with vernacular buildings and landscapes in fresh and compelling ways. Her research uses camp photographs, documentary information, and field-based researchundefinedsome of it conducted in summer while camps were in session. 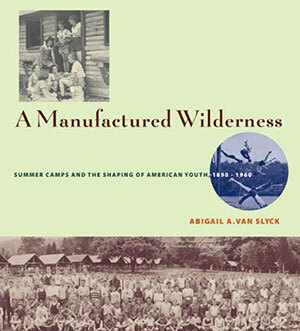 Beautifully written and thoroughly illustrated, the book covers the historical and ideological origins of summer camps and their development to 1960. For many of us, it is a journey to a past we remember with a sense of nostalgia, yet Professor Van Slyck reminds us of how complicated these institutions were. She traces the development of camp layouts with their attendant structures; the programmatic activities that influenced camp designs and materialized cultural anxieties; the hygienic, psychological, nutritional and social precepts incorporated into camp facilities; and the gendered and cultural biases that shaped the lives of campers and the landscapes of camps. This book is an important contribution to the history of the family, and to our field. Our scholarly enterprise is suffused with the study of people and their things; Abigail Van Slyck reminds us all that we cannot fully understand parents’ buildings and landscapes if we do not understand children’s.